Caribe Club Princess! Situated on one of the most beautiful beaches of the Dominican Republic, in an area where the beauty of the countryside and the delightful crystalline water, combined with fine and delicate sand, leave visitors with a strong feeling of pleasure and an exceptional sensation of relaxation and peace. Feelings which reveal never-ending possibilities as we stay in one of the marvellous Royal Suites, or allow ourselves to be seduced by the charming Honeymoon Suites, all of which include every convenience. The full top-quality service in the Caribe Suites and the Superior Rooms provides the perfect complement to the various leisure and entertainment activities available day and night (top quality food in the restaurants, a variety of beach and poolside activities,water sports, Children's and Teenagers' Clubs, Gran Casino (in the Bavaro Princess, with free transport...), the perfect holiday in a location of incomparable beauty. • All inclusive 24 hours. • FULL use of 6 restaurants, 7 bars. • Pool for adults and children (with bar in the pool). • Evening entertainment in the Lobby and Shows every night in the Serenata and La Rumba Theatres. • Areíto Discotheque (admission free; national drinks included until midnight). • Gymnasium, Sauna and Jacuzzi. • Introduction to diving in the pool (1 lesson per person per stay). * Use of all facities and services at the Hotel Tropical Princess. • “La Cava” and “El Pescador” Restaurants. · Metamorphosis Spa (avalability of packages at extra cost). • Shopping area: boutique, photography, gift shop and mini market. (Reservations should be made for dinner only and excluding the “Higüero”, they should be made at the Public Relations desk from 09.00 h to 12.00 h (same day bookings) and until 16.00 h (next day bookings). Open from 18.00 h to 21.00 h.
Open from 18.00 to 21.00 h.
Open from 13.30 h to 18.00 h.
Open from 19.00 h to 21.30 h.
The Hotel Caribe Club Princess has 4 bars, serving alcoholic and alcohol-free drinks and cocktails. • Tennis, Mini Golf, Archery, Bicycles and Table games. • Club for teenagers (from 13 to 17 years of age from 09.00 h to 23.00 h ). • Club for Children (from 4 to 12 years of age from 09.00 h to 18.00 h ). • Outdoor games area for children. • Daytime activities on the beach and by the pool. • PRINCESS TOWER CASINO with free transport service. • Church with religious services. Service: good not great but they do their job. Food: very decent food for an all-inclusive. Thanks! We look forward to planning our November stay with you as well! Hi Frank, Marcy & Karin! 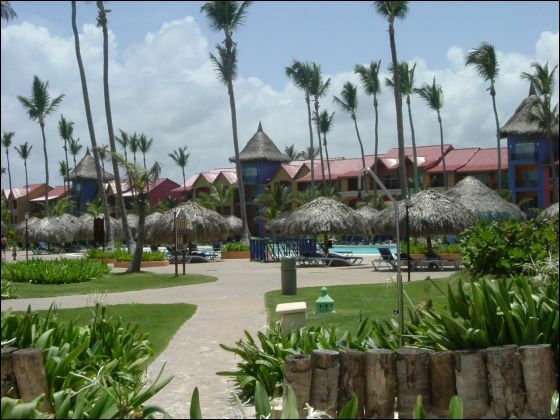 The trip to Caribe Club Princess was lovely; definitely a time to relax and unwind. As always - great job in making the planning of the trip much less stressful! You make it so easy! The Charter flights - were on time and as comfortable as a 4 hour flight can be. Transfers on the bus - were comfortable, one leaky air conditioning vent caused a couple of passengers to move to different seating. Beach - clean, sand was the best, even exfoliated the skin with the sand; always found beach chairs under grass huts. In Mexico it was more crowded and you had to get up before dawn to save a spot near the water. Pool - looked clean, didn't get in because the beach was so much more desirable. I did get in the "hot tub", which was clean, but just luke warm water (but I'm sure most people don't want to get in to hot water when it is warm outside). Service - mostly friendly service, usually didn't have to wait long to get a drink or eat. At Italian restaurant, we waited for about an hour to get any food, but I've been to Italy and this is just all part of the dining experience :). Food - Upon arrival, the food in the buffet food was great. Lots of variety and fresh. The Italian Restaurant - again, slow service and the cannelloni was too salty for my taste. The Brazilian, Mexican, Chinese Restaurants had outstanding food quality and service. Rooms - I had a first level 2 double (maybe queen size) bed room. The service was good, but with the humidity in the room, our clothes never seem to dry completely. I also really needed a alarm clock (and should have brought my watch). I usually don't travel with one since most rooms have them available. It is nice not have to be on a schedule and worry about the time, but sometimes one is needed. I would advise travelers that a clock is not provided and there aren't many clocks on walls in the area. The operator was good about telling me the time when I called. Language barrier- most staff could speak the English language, not all, but all were eager to help. We found that those working at the front desk were able to speak English and were very helpful. Some of the workers, maids and such, did not speak much English. Entertainment - I was a bit disappointed in the entertainment. Several shows were lip syncing, the dancing was quality on two shows. But there again, it was fine and not the deal breaker on a vacation, right? All in all, the vacation was great and well worth the money and effort getting there. Thank you for your assistance in making it happen. I will recommend you to friends and family. You have always been a joy to work with! And have always been great on finding us packages with the biggest bang for our buck! I just wanted to let you know we really enjoyed our first time in the Dominican. The Caribe Club Princess was everything we wanted! The transfers and plane ride went super smooth. We thought the food was good at the buffet, Chinese restaurant, Mexican restaurant and especially at the Brazilian restaurant. The snack bar food was pretty good and always well stocked. All of the staff members we dealt with were very friendly. We befriended the young man in the towel cabana and took him to lunch several day's which was an added bonus as we learned about the culture. The room itself was clean and well maintained. The lobby was very nice and the grounds were always beautiful. The sidewalks were always clean. We did not use the pool but we noticed it was always in pristine shape. The beach itself is one of the best I have ever seen and kind of reminded me of Hawaii. We loved the ocean because of the sandy bottom. We didn't have to even wear water shoes to avoid cutting our feet on the coral like in Mexico. The teens and men used the kayak's a couple of different times and the boogie boards. When they tried to get those items earlier in the week the people in the aquatics dept. would try to sell them other items and they were unable to get the boogie boards. Once they met the young man who worked for the resort they were able to check out the equipment much easier. On the beach, they would clean up any of the seaweed up each morning. There were quite a few men on the beach attempting to sell things which was slightly irritating. There was a building at the edge of the beach where a group of men tried to sell time-shares. One man in particular would wander over several times a day and pester us about coming over to see the time share. But if you just ignore them, they will leave you alone after a while. We went to a few of the shows which weren't too bad. All in all we would give this vacation a 4 star out of 5 star rating. 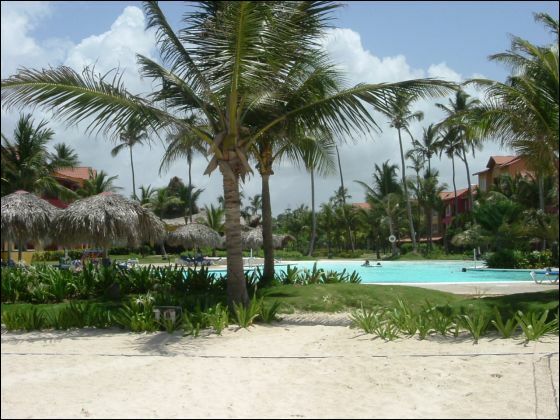 We would definitely recommend the Dominican Republic to anyone as a beautiful vacation destination. Thanks for all of your help with the planning of this trip! We have all kind of decided to try to do one of these trips every couple of years so we will definitely be in contact!